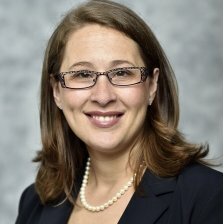 Jennifer Silk serves as the Senior Advisor for Cybersecurity at the Department of Energy where she guides policy on enterprise and energy sector cybersecurity issues. Prior to joining DOE, she served in cybersecurity and policy roles in the federal government including overseeing U.S. Air Force international partnerships and positions at U.S. Cyber Command where she developed its concept of operations and led the team responsible for partnerships development. She served as the director for cybersecurity policy at the National Security Council where she led efforts to strengthen critical infrastructure cybersecurity. Before joining government, she gained systems engineering and integration experience with Lockheed Martin and Northrop Grumman. She started as an airborne linguist in the Air Force. She holds degrees from the University of Nebraska and George Washington University.